You may not have realized it, but several of the terrific restaurants we enjoy here on the North Shore are the result of the hard working folks at Serenitee Restaurant Group. The group (previously known as North Shore Restaurant Group) has just unveiled a fun promotion aimed at encouraging diners to discover restaurants they may not have tried and, of course, to get out to old favorites as well. 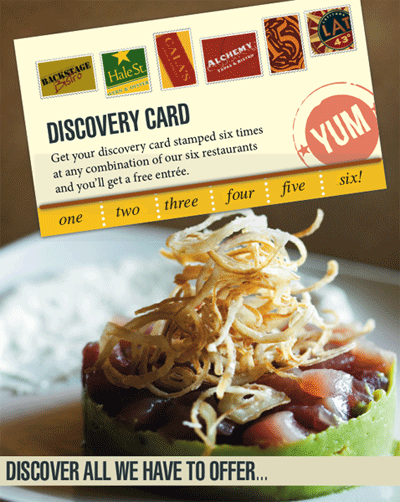 At any of the six eateries, all with unique atmospheres and cuisines, you can pick up a “Discovery Card” that gets stamped with the purchase of a meal. Whether from six different restaurants or the same one, after you accumulate six stamps, you are rewarded with a free entrée at any of the locations. You know us, we’ll use any excuse to get out and try different restaurants, and a free meal is a great one. The offer expires December 31, so there’s plenty of time to explore these North Shore eateries.